WASHINGTON—Claiming he has always been “a bit of a loner,” members of Congress expressed their deep concern Friday about Sen. Jeff Merkley (D-OR), whose legislation has reportedly become increasingly violent and disturbing in recent months. “His bills have had some pretty dark stuff in them lately, and he’s been using a lot of very brutal language and imagery,” said Senate Majority Leader Harry Reid (D-NV), adding that Merkley often hangs around the Capitol Building by himself listening to his headphones and rarely ever talks during meetings of the Senate Subcommittee on Financial Institutions and Consumer Protection. “In the Rebuilding Equity Act he handed in the other week, there were several subsections in which people were getting stabbed or shot, and when I asked him to insert an amendment on mortgage loan ratios, he just added a long paragraph about watching blood pour out of somebody’s head. 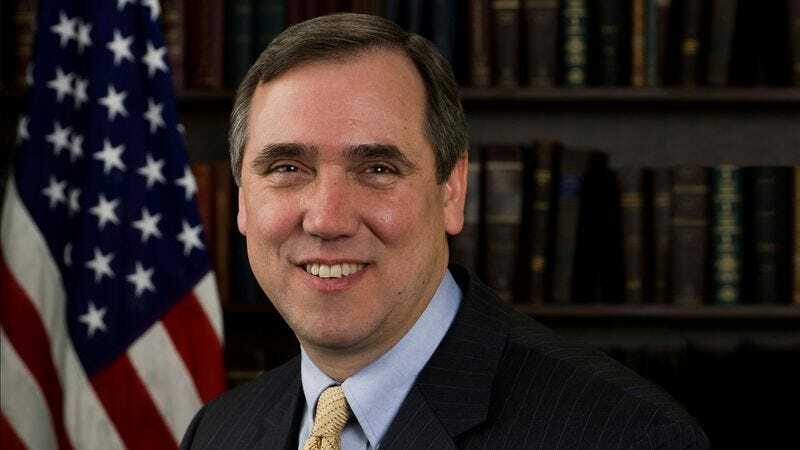 I’m starting to really worry about him.” Despite Merkley’s inclusion of an explicit cry for help in a bill on farm subsidies last week, sources confirmed a hold had been placed on the legislation to prevent it from ever reaching the Senate floor.